10% discount in Restaurant and Bar. Breakfast excluded. 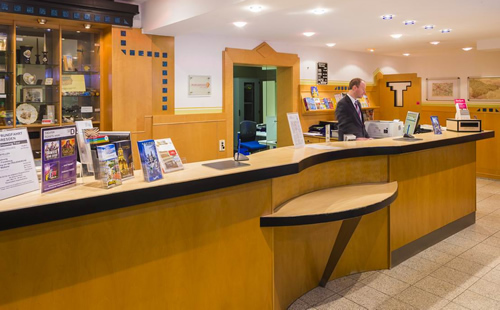 The first class hotel Am Terrassenufer is situated near the historic part of the town in the inner city of Dresden. Its international character turns your stay into a relaxing experience not only for businessmen but also for holiday-makers. From the Bruehlsche Terrace near the hotel you can get a view of the "Florence on the Elbe" with its White Fleet and the famous skyline. All famous sights as well as the commercial center and the government sector can be reached easily walking in a few minutes. You would like to stay in the immediate vicinity of the storical part of Dresden? Semper Opera House, Zwinger, Church of our Lady (Frauenkirche) and all the most important museums and art galleries, i.e. Alte Meister, Green Vault (Grünes Gewölbe) within walking distance. You need a hotel, easy reachable either by public transportation or by car? You esteem a smoke-free hotel?